If you love sushi and you are in the vicinity of San Diego there is a good chance you've heard of this place or have given it a run and thus become hooked. I wrote about this place approximately a year ago and you can read it here. EHK and I used to save visiting Sushi Ota for special occasions but as of last October became frequent regulars - coming every or every other Saturday when in town. Along with our change in visiting frequency, or seating and ordering preferences have changed as well. We were big proponents of siting across from each other when we first started dating... its tough to maintain a conversation when siting side by side. So that meant siting "with the commoners" (as another regular put it) in the general dining area. I was blissfully ignorant for about 2 years! Heck the food and service was good so I didn't have much to complain about. 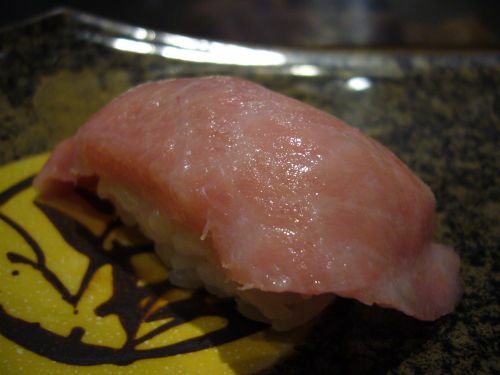 At that time when EHK introduced me to Sushi Ota I had little experience in this delicious frontier. According to Jason on jatbar, I was experimenting with level 2 of 5 in sushi eating. Pathetic right? During those 2 years of being content in the general dining area I gradually worked up to level 3 and started touching on 4. One day about a year ago, MK told us there was no comparable way to eat sushi like eating it at the bar in a good place. So we decided to give it a run and we were hooked. We've found that you can develop a good relationship with your itamae (sushi chef) thus leading to better cuts, more creativity, offerings of stuff not on the menu and better pricing. We've ate with several different chefs at Sushi Ota but one day we sat with Robert aka Atsushi and decided that we couldn't eat with another chef. He's originally from LA, I believe Lancaster and got an Electrical Engineering degree from SDSU but decided that working in that field wasn't for him. Good for us! He's been there 3rd longest behind Ota-san and his brother. His creations are exquisite, creative and tasty. His family is in the sushi business so I suppose it was only natural that he followed in suit. He commands quite a following of regulars so it's not uncommon to see other regulars and get to know their tastes as well. When we first started siting with Robert we were used to ordering from the menu and stuck with that. He gradually weaned us from that by offerings of things not on the menu. We became intrigued and then I remembered Captain Jack leaving a comment on my old post saying he usually gets the omakase (chef's choice, entrust) with Ota-san. We asked Robert about it and he told us it was a multi course meal of different types of food but since we loved sushi so much he could make it a point to make it a sushi centered omakase for us. Thus began our real adventures into the sushi world. Every trip since then has been a different but wonderful tasting experience and we've been flirting with level 5!. Below are photos of our latest excursion. We started off with 2 appetizers. 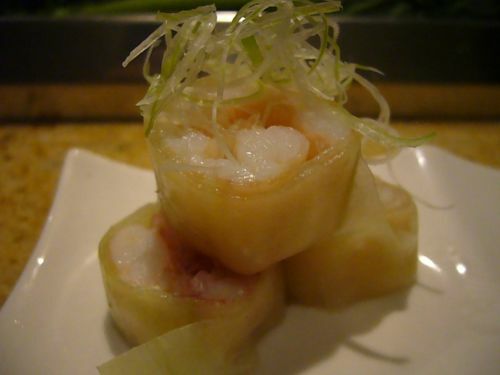 The first was snow crab wrapped in sugar/ rice vinegar(I think?) marinated cucumber. I've had good experiences with cucumber wrapped anything and gleefully accepted this appetizer. 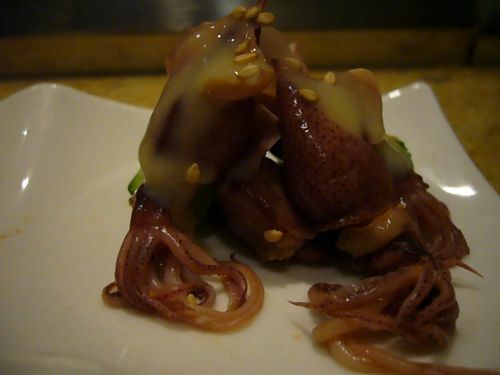 The second was miso marinated baby octopus. The octopus was just lightly chewy and the miso lent a nice flavor. I wanted to ask how this was harvest but forgot to. I definitely will next time. Oh my we were so surprised to get a serving of toro so early. I'm always giddy with delight when I eat this. Toro prepared any way is just plain out of this world. I always feel that you don't have to take too much effort to consume this. Maybe a bite or two and the rest just melts like butter in the mouth. I'm such a fan of salmon belly. Robert offered us salmon belly with a balsamic reduction sauce. It was interesting and different but just as buttery and tasty as the plain version. The yellowtail was pretty good- light, tender with a subtle flavor. 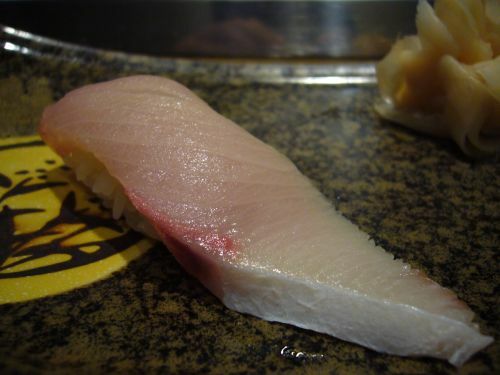 However, I'm a bigger fan of the jumbo yellow tail. Robert presented us with very intrigue dish of baby sea eel and a small bowl of ponzu sauce for dipping. 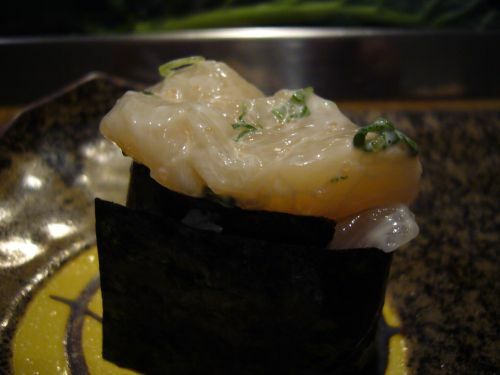 It was tasteless except for the taste of ponzu sauce that it was dipped in and the textures was soft and squishy. He told us that these were caught in the wild off the coast of Japan. Quite impressive! I can't imagine being able to catch these little critters. We were informed that they grate fresh wasabi here. 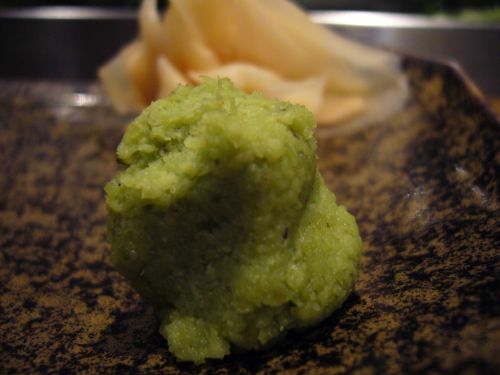 I'm not the biggest fan of wasabi so I don't use much of it. I've had some terrifying experiences with oysters but EHK encouraged me to try the Kumamoto oysters with him(they are in the fancy shaped bowl). On this plate was also a piece of Japanese King mackerel and a snow crab leg. I'm glad I gave the oysters a run. They weren't extremely meaty but very tender, amazingly sweet and I love anything with a hit of ponzu sauce. EHK loved the Japanese King mackrel and didn't use any of the accompanying sauce but I wasn't really digging it. The snow crab was sweet and meaty but I like their Alaskan King crab which is way sweeter and meatier but more of a challenge to eat. 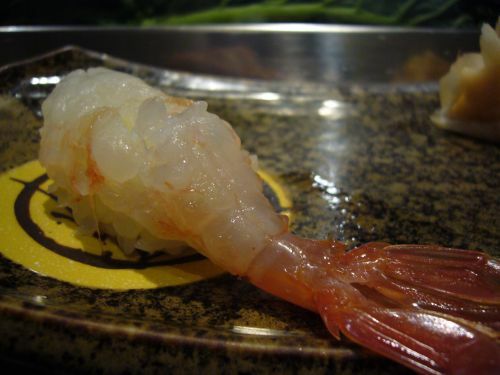 Next up was ama-ebi. I love shrimp but the wasabi was a little strong on this one. So much that it started to tickle my nose. Robert really likes the "5 chiles of Japan" marinade. 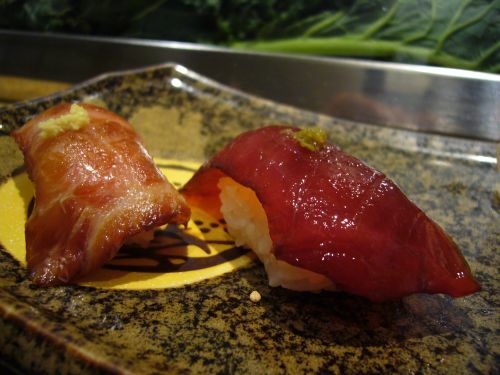 On the left is toro and the right is maguro. Of course you gotta start with maguro in this offering. The marinade is a little strong with maguro as there is no fat to cut it. The toro is really the way to go... the fattiness cuts and is a perfect complement to the spicy marinade. I've told Robert that I like this marinade with the toro(anything toro is good) several times but I suppose offering it to us like this makes us relish the toro more. 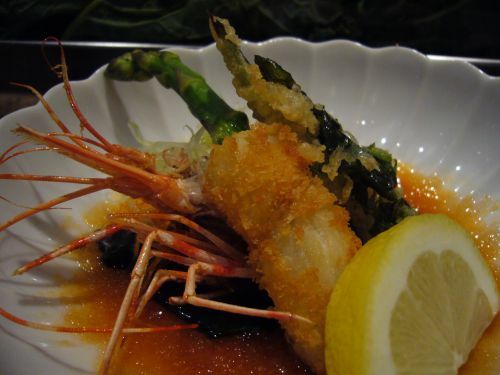 Next up was the head of the sweet shrimp lightly fried, asparagus and Japanese mustard leaf in a small pool of ponzu sauce. I'm not big on shrimp heads so I didn't enjoy it as much as EHK. 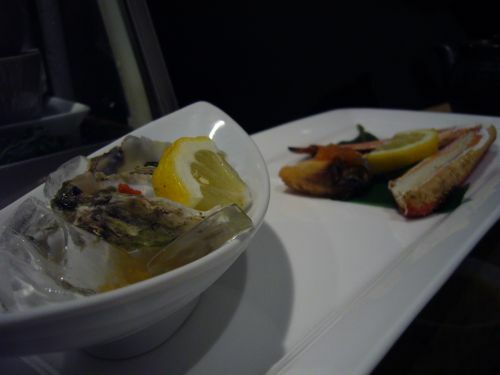 I really liked the mustard leaf though... it had a very nice light crunch to it and ponzu for dipping! 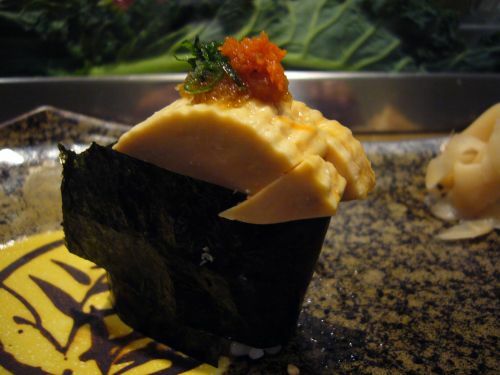 Monk fish liver aka foie gra of the sea. I love just about anything liver and this isn't an acception. So deliciously rich and smooth the rice did do a nice job of making it not too overpowering. Marinated sea scallops! I used to think that scallops were hit or miss. I'd hate to get a mouthfull of scallops mixed with gritty sand... it's possibly the worst seafood experience for me. However I've had this numerous times with Robert and it always sliky smooth, light and refreshing. 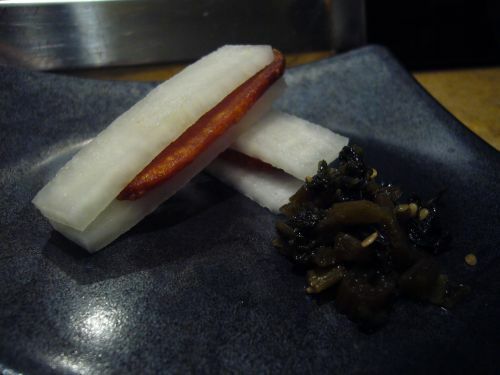 Fried smoked fish roe sandwiched with daikon and a small mound of Japanese rhubarb. I'm deathly afraid of daikon ... there's a belief in my family that daikon gives you white hair or speeds up aging. My dad looks 10-15+ years younger than his actual age so I'll take advice on how to maintain a youthfull appearance from him to heart. I tried it just this once and I have to say I'm not hankering to try it again. The roe was interestingly crispy and smoky which contrasted greatly withe plain crisp taste of the daikon. I really don't remember much about the rhubarb other than it was marinated with miso. Orange clam was the last thing we tried. It was a litter more chewier than I'd prefer. The flavor was very light and subtle. I'm still experimenting with subtle flavors. I'm so used to strong, in your face flavors and would very much like to learn how to appreciate the more delicate ones. Hi there Jeena. Thanks for stopping by. I'll be sure to check your site. The cucumber wrapper is a nice idea for a light low carb alternative. It's so light and refreshing. I like it when Robert uses it for a wrapper with some soft shell crab and spring lettuce mix with ponzu dressing. *Sigh* sushi can be a pricey fare to indulge in but it can be affordable. Brown bag lunches, cut back on Starbucks, make most dinners at home and you are well on your way to a guilt free trip to the sushi bar. I eat just about all my lunches at home and most dinner as well unless it's somewhere fairly casual. Wow, that meal looked fantastic! I've never been to Sushi Ota even though I live very close and have no excuse for not going. Your pictures are yet more evidence that I *need* to go. If you do go I highly recommend asking to sit with Atsushi(Robert). Call a few days ahead for a reservation. 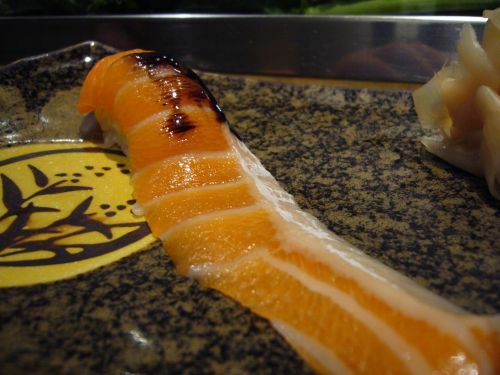 With as much as I love sushi, it is so unbelievable that I still haven't been to Sushi Ota. Seeing these pictures upgrades it on my to-do list. I'm ordering the cucumber wrapped appetizer for sure! Glad the post helped move Ota up on our list. Hope to see you at Eclipse Chocolat next week.